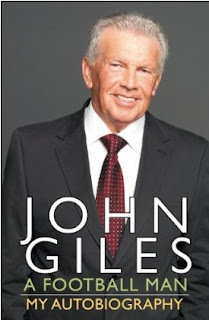 I have just finished reading John Giles' autobiography "A Football Man". 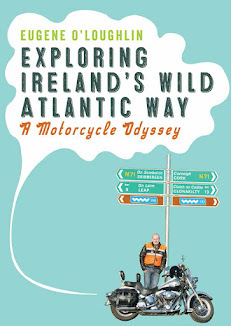 Though I did not attend his book-signing, I do have a signed copy courtesy of my daughter Kate, who works in the Dubray Bookshop in Blackrock. I've never met Johnnie Giles, though I did see him play once for Shamrock Rovers in a League of Ireland game against Limerick in Milltown around 1980 - I don't recall seeing him play for Ireland. The biography is a enjoyable read, though the story of John Giles is well known to people of my generation. There's very little new in this book, though he has plenty to say about Matt Busby from his time at Manchester United. Of course his early days as a boy in Ormonde Square provided an insight into how this great footballer grew up, he didn't much like school (Brunner), and seemed destined to play football from the beginning. His time at Leeds United was very familiar to me as Leeds were the team that everybody hated when I started to follow football in the late sixties/early seventies. Indeed I remember that in school during 1970, after the Chelsea vs Leeds FA Cup final, we divided into two teams for football, and I wanted to be on the Chelsea team. Giles was a tough hard player which contributed to the Leeds United image, and to his credit, he does not try to play down this in his book. His thoughts on "The Damned United" make for one of the few new and controversial bits in the book. This is the second of three biographies that I am reading - the first was Abraham Lincoln (reviewed here), and next up is a new biography of Patrick Pearse. Very different people - a Leader, a Footballer, and a Rebel. In fact, John Giles could be regarded as having all three characteristics! Not just a football man. Leeds were the best consistent side of the late sixties early seventies. The vast number of Irish Leeds supporters, more branches of official supporter s than any other club, is testament to their enduring popularity. Hi "Anonymous" - thank you for calling me a "waste of space". It seems that my choice of Chelsea over Leeds in 1970 as a small boy somehow causes you some upset. It causes me upset that you think that because of this I am "obviously not a football man" - I'll have to choose my words more carefully lest I offend some delicate souls like you in the future. If you look elsewhere in this blog you will see that I am Preston North End fan. I have only one thing to say to you! Leeds 4 PNE 6 - now that's something that counts!!! You say yourself you hated Leeds - so it was acceptable for other teams to have players who could look after themselves but not Leeds? This is the point Giles makes throughout the book. John Giles is a legend. Great comments and thanks for reading my review - I am in full agreement with you, John Giles is a "legend". As for your question: "so it was acceptable for other teams to have players who could look after themselves but not Leeds?" I didn't actually say it was "acceptable" in my review. There were plenty about who could look after themselves - Tommie Smith and Chopper Harris come to mind.